It's back. Now the max picture size is 1067x600px (16:9). And this month topic is Crossing the river. Remember to use a free license. You must post only images under the following licenses: CC0 (Public Domain), CC-BY 3.0 or newer, CC-BY-SA 3.0 or newer. Somekind based on th real Kita Senju station (see: http://goo.gl/maps/ogIeT ) At this spot you will see a lot of trains crossing the arakawa river carring a lot of commuters from various destinations to the city core and viceversa. 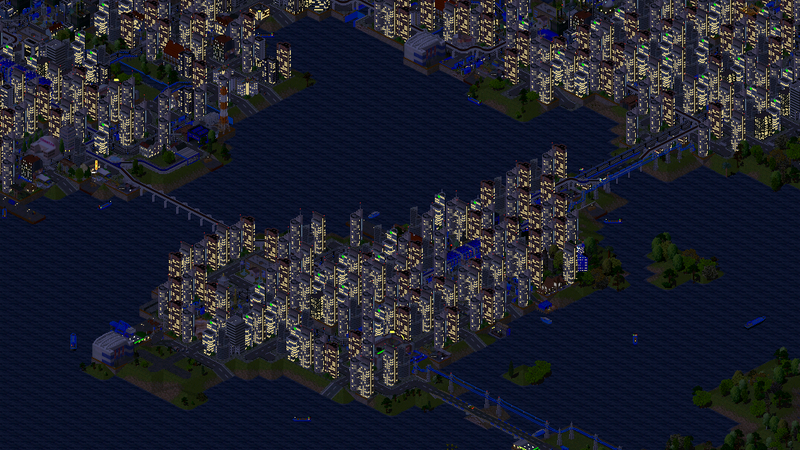 Screenshot name: River Terminus. Not from a real game. Not much to say about it. 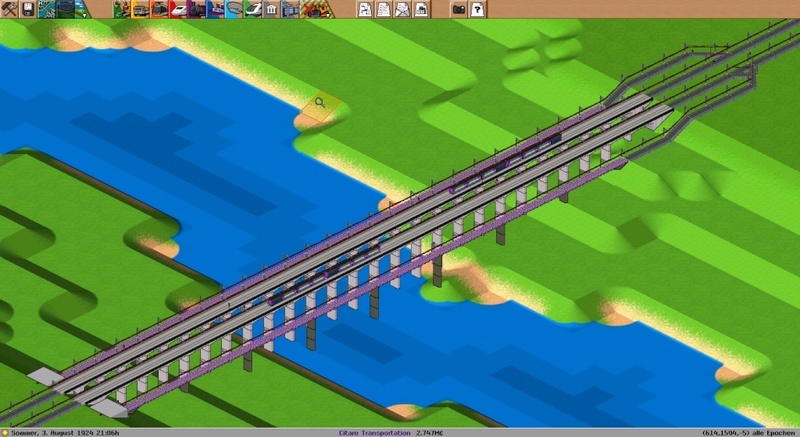 Just thought 2 entrys are not enough for a proper contest, and given that the other two show a heavily crossed river, I thought a single small bridge would be a nice contrast. Rainbow Bridge - it's a variation of the famous bridge over the Sumida river in Tokyo. 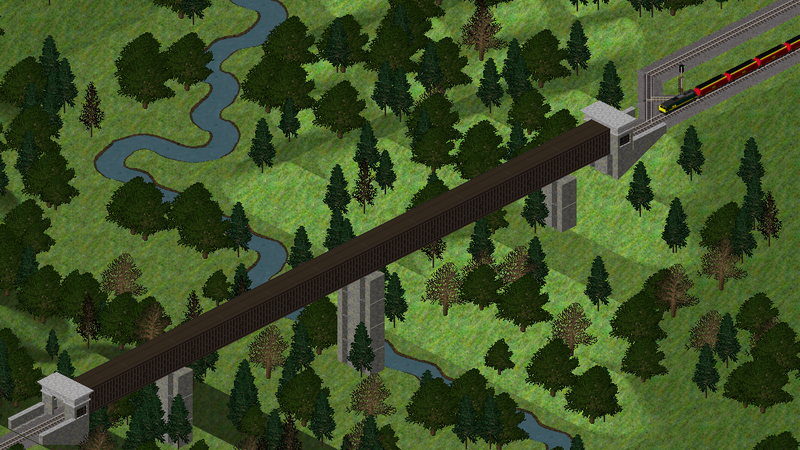 It has two levels like the original, but in my game in 2200 year on the top level the fastest maglev trains rush to the Narita airport. The Canal of Castile is a navigation canal in the North of Spain. It rounds trough three provinces (Palencia, Valladolid and Burgos), in Castile and León. Its main goal was to improve the wheat transport from inland to northern harbours. The construction began at the second half of 18th Century, during Fernando VI reign. At those times, Castile had few population and a weak economy. Also, some industries were built along the Canal, like mills. Peninsular and Carlist Wars and a weak Treasure made difficult it to finish the project. Also, the Canal became obsolete when the first railways were buit, so its main purpose became irrigation. Today, it is a touristic atraction, and several boats go trough the Canal. Locks and aqueducts are very interesting. 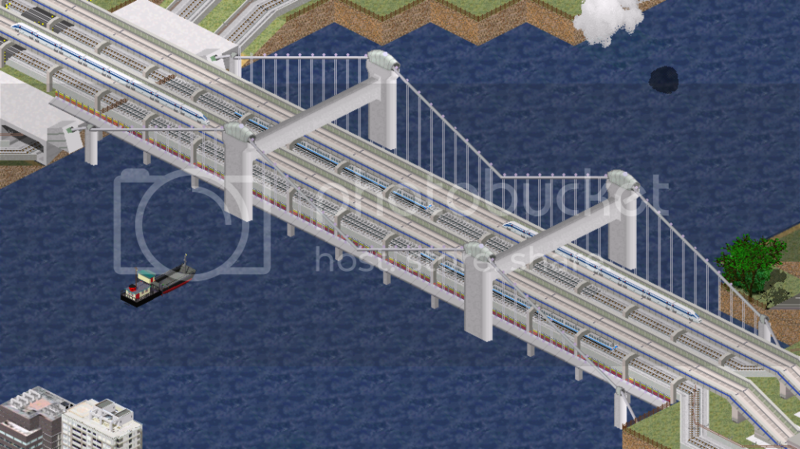 At this screenshot (a created scenario, not a real game) we can see the Canal, an old mill, and an aqueduct. A modern railway cross the Canal and the road. - Pegaso 5070 SETRA-SEIDA S-14 (coach). - Barreiros 8235 B Turbo 300 (white and blue truck). Robert's bridge - this bridge was built long time ago by famous railway engineer Robert, son of George. BR Class 57 is approaching the bridge, heading for High Peak ore mines, to load iron ore for Casterbridge stell mills. Crossing the river is a feature of daily life for the residents and workers of this city, built on a cataract in a large river estuary. Murayamabashi is road-rail bridge of Nagano Electric Railway(Nagano dentetsu) in Nagano city. It was renewed in 2008.